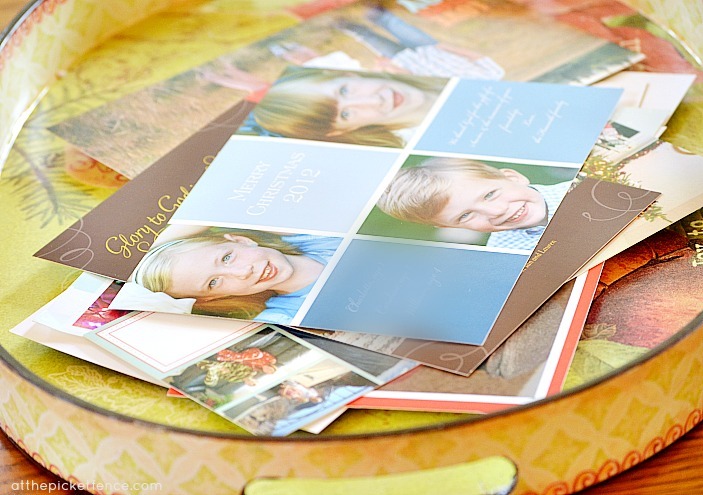 Do you do projects for your home that are so simple you find yourself wondering if they are truly “blog worthy”? 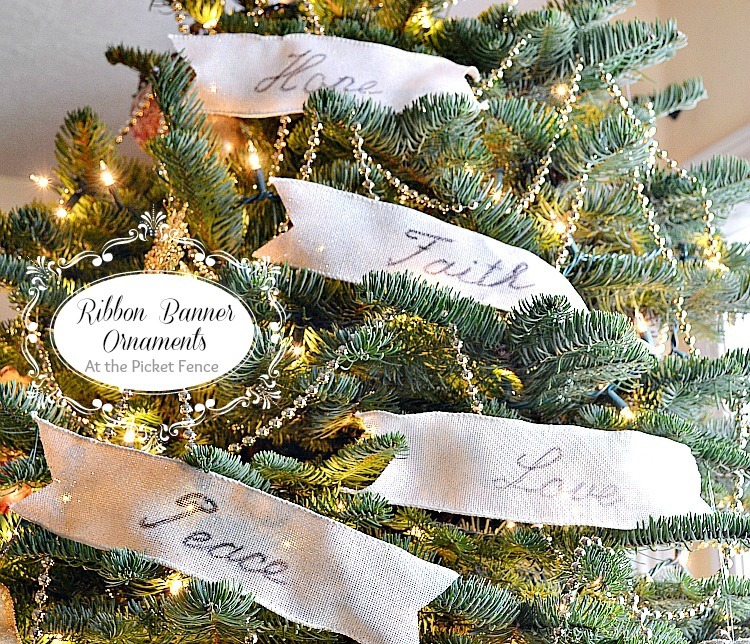 Projects like..oh..I don’t know…tracing words onto pieces of ribbon with a sharpie and then sticking them on your tree. These projects don’t require a lot of supplies or a tutorial. And this can make you question whether or not to even share them because of their simplicity. But, then you wonder if maybe others would welcome a little simplicity. 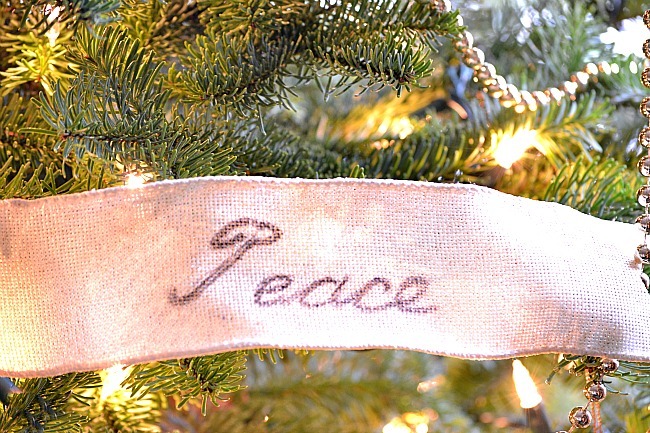 And maybe even a little “Faith, Hope, Peace and Love” being added to their Christmas tree. I remembered I had ribbon left over from my mantel and banister (which you can see in our Holiday House Tour) and thought my rotund tree would benefit from the soft creamy ribbon being added to it. An item from Pottery Barn which is no longer available was my inspiration for this project. Can you see why I wondered if it would be “blog-worthy”? It’s beyond simple. But, I’ll tell you something. Seeing those words splashed all across my rotund tree has given me great pleasure. Probably more than any other decor I’ve added to my home this season. I’ve found myself pausing and staring at these banners throughout the day. Reflecting on the meanings of each word. Remembering what “it” is all about. This led me to realize that I could do something that might possibly be even less “blog-worthy”. Oh yes. While there are tons of ideas for displaying the holiday cards you receive, I’m doing something radical. I’m putting our cards in a tray on our kitchen table. Want to know why I did this? Well, each night at dinner we pull out a different card from the stack. And then, before we eat, we pray for that person…or that family. It is one more simple way to remind us of how blessed we are to have all of these amazing people in our lives. And I think that just might make it blog-worthy…don’t you? P.S. The Ribbon Banner Ornaments shown in these photos were “staged” and aren’t actually all bunched together on my tree like that. Just in case you were wondering! We’ll be in contact to get you your prize. 33 Comments on "Ribbon Banner Ornaments and Being Blog Worthy"
Both ideas are so definitely blog-worthy, Vanessa! It seems so typically you to do both of these sweet ideas! The project and message are more than blog worthy!! !…Love how you traced the words!..great idea! Congrats to Pam…and have a wonderful week Heather and Vanessa! Congratulations to Pam on her beautiful win!! And what a Simply lovely idea and I also LOVE the card idea as well, what a fun and great way to enjoy all those Christmas cards. Sometimes the simplest things make the biggest impact…and this is one! 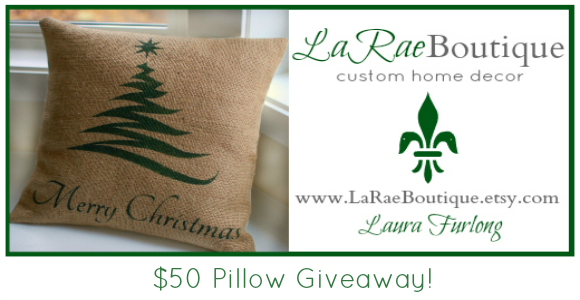 I have a small tree on the side porch that I need to put something simple and rustic on, so I think I’m get my sharpie out and make some out of burlap ribbon! Very sweet Vanessa~ they are darling! I think any project is blog worthy! I love getting ideas whether I use them or not. I like this one though. It’s easy and cheap but looks very nice! I think anything with words is popular right now. They look great on your tree. These are so blog worthy, I think they are lovely and the meaning of Christmas. Congrats to Pam!!! I think that any project,no matter how simple, can trigger someone else’s imagination to take your project and give it a different twist. That’s what were all about…. Love your sweet, blog worthy,creations! The ribbons are wonderful! Definitely blog worthy because I’m not very crafty and I can handle something like this! Thank you so much and Happy Holidays! Congrats to Pam! I definitely think that is blogworthy, Vanessa! Sometimes people are looking for simple but might not think of something like this. 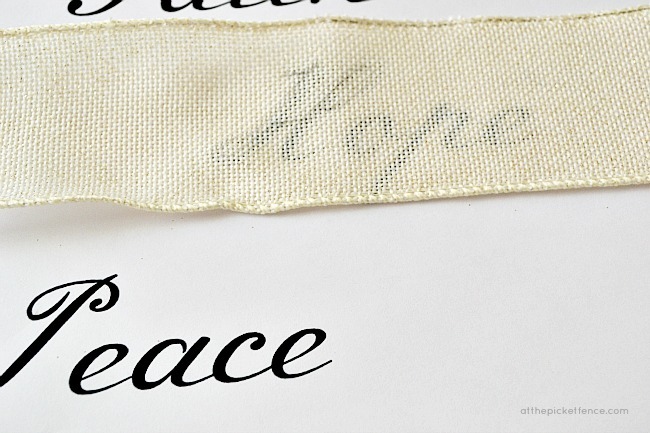 I never would have thought of tracing the words onto ribbon. All of your projects are blog-worthy…but I know what you mean. There are so many things that I do that don’t actually make the “cut” to get on my blog. I think, who will care about that. Maybe they would more than I think. Love all of your ideas. Of course that’s blog worthy!!! Yes it’s so simple, but it’s behold beautiful and love ideas with the words with much meaning. Thank you for the inspiration! I think these are definitely blog worthy! So pretty! I was hesitant about posting my living room tree.It is a bit sad this year.But I decided to put it out there.Sometimes I think I get too picky about what I should put out there and what I should not. 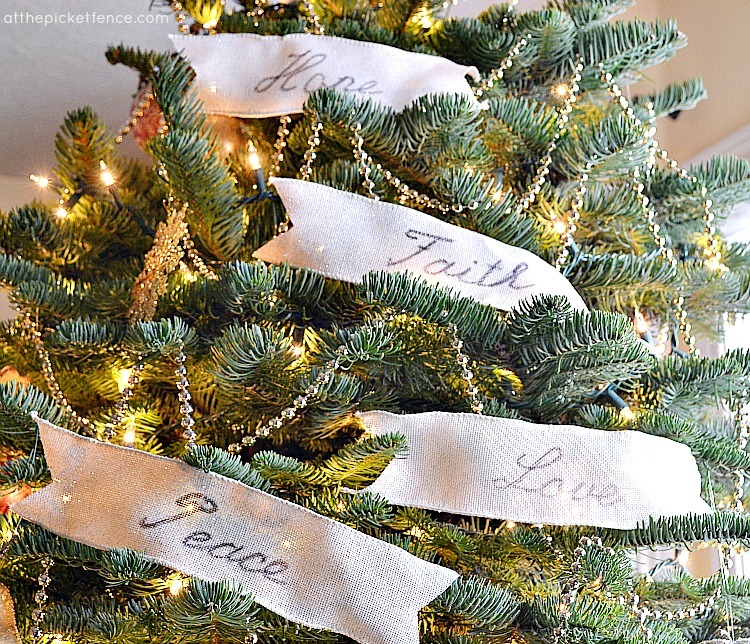 I absolutely love these ideas…they are both lovely and I think I might put your ribbon idea into action on my tree tonight! Thank you for sharing….I wouldn’t have thought to do that. I actually really love reading about little tips and tricks like that….and beautiful ideas like pulling out a Christmas card to pray for a particular family each night (or day). 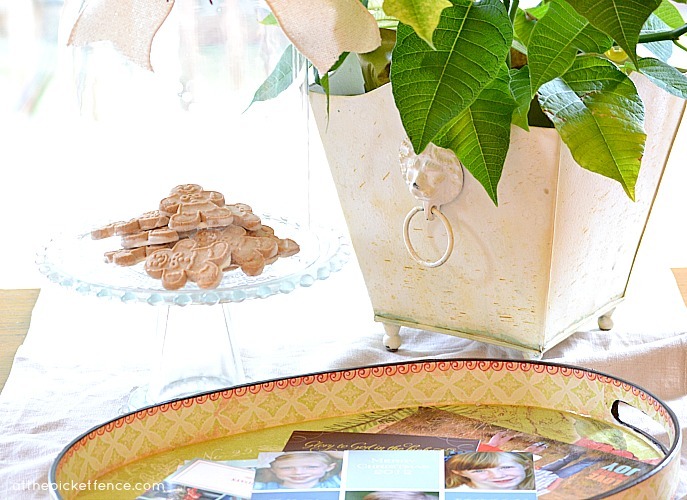 THANK YOU for sharing….these ideas of yours are certainly blog-worthy!! Love it Vanessa, definately blog worthy! I embrace simplicity. Love the banners, and card idea. Sometimes the little ideas make the largest, most meaningful, impact. 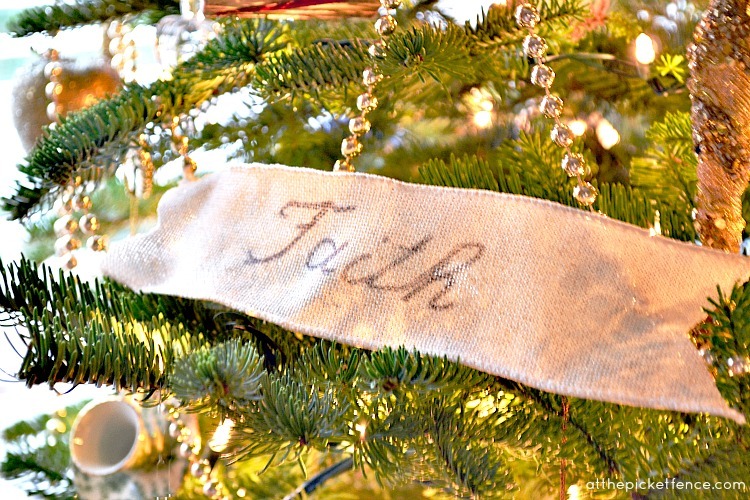 Love those meaningful words on the little ribbon banners, words we all need to hear and see repeatedly at Christmas and always! I do the same thing with my cards, except they’re in a basket. Your blog content and ideas are always worthy and we look to you for inspiration and creative suggestions! Have a beautiful Christmas! You girls always make me smile:) Just wish I could get over here enough to do that. I question my blog worthiness posts, ALL THE TIME:) LOL…not really, I just do it because I enjoy it, and sometimes others do and other times, I can tell it’s a uh, it’s OK LOL!~ I do love this project. Merry Christmas to you and your families. They are very blog worthy because I wouldn’t have thought to do that… and now I will! I love this idea because it’s totally do-able! Thanks and Merry Christmas!